Recently, in her Bible study class, Carolyn read Psalm 91:11. When she read the words: "God gives His angels charge over us to guard and protect us," she envisioned a benevolent angel hovering over a sleeping child. The angel that Blish pictured was a loving being, tucking in the covers to make sure the child was safe and warm. She began sketching on the spot. 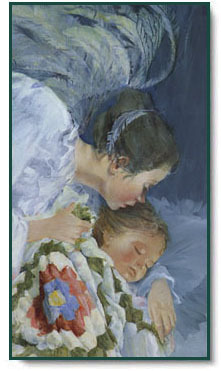 Her beautiful and comforting painting, Angel Watch, was a result of her inspiration and her faith. Angels are a source of comfort; heavenly messengers sent for man's protection. Angel Watch copyright© 1995 by Carolyn Blish.